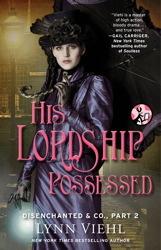 One of the most interesting characters to write in Disenchanted & Co., my new steampunk urban fantasy novel series for Pocket Star, has been Lord Lucien Dredmore. A master of the dark arts with a mysterious past and a terrifying reputation, Dredmore is a deathmage, which in my universe is a kind of legal magical assassin. He’s also become rather obsessed with my lady detective protagonist, Kit, who doesn’t believe in magic and wants nothing to do with him. Kit has convinced herself that Dredmore is simply just another charlatan swindling his clients with a lot of silly tricks. Dredmore, on the other hand, can’t understand why neither his dark charms nor his magic have no effect on Kit. It also doesn’t help that they’re both very frustrated by — and attracted to — each other. Whenever the two of them get together on the page I have to lock the office door so my fun writing them isn’t interrupted. 1. All of his friends are morticians, medical examiners, forensic investigators or hazardous waste disposal techs, while the hopeful-looking guy who keeps following him around turns out to be a necromancer. 2. Borrowing a book from his library without asking results in a strike force of anti-mages surrounding your apartment while a cataclysm-prevention negotiator uses a bullhorn to try to talk you out (in Latin). 3. Every time he has a sneezing or coughing attack all of your houseplants instantly turn to ash. 4. He knows one thousand, four hundred and twenty-eight ways to remove a bloodstain from your blouse. 5. He subscribes to a dozen newspapers, but the only sections they send him are the obituaries. 6. If he startles you and you accuse him of nearly scaring you to death, he frowns and checks his hands. 7. James Bond movies make him chuckle sadly and shake his head a lot. 8. The list of emergency phone numbers on his fridge are all for funeral homes with express service. 9. When you ask why he dresses only in black, he doesn’t say because it makes him look thinner. 10. When you’ve had an extremely bad day and mutter something about wishing you were dead, he accuses you of picking a fight with him. 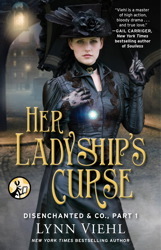 I hope you’ll check out Kit, Dredmore and the rest of my crew in Her Ladyship’s Curse, Part I of Disenchanted & Co.—out this week!–and Part II, His Lordship Possessed, out on October 14th. Both Parts will be bound and printed in mass market format for January 28, 2014, and the full-length sequel, The Clockwork Wolf, will be available in print and eBook on February 25, 2014. And if you want more information on Kit’s world, check out the blog dedicated to their world: www.toriana.blogspot.com. Part 1 of Disenchanted & Co. : In a steampunk version of America that lost the Revolutionary War, Charmian (Kit) Kittredge makes her living investigating magic crimes and exposing the frauds behind them. While Kit tries to avoid the nobs of high society, as the proprietor of Disenchanted & Co. she follows mysteries wherever they lead. Part 2 of Disenchanted & Co. Charmain (Kit) Kittredge, who makes a living debunking "magic" in an alternate version of America that lost the Revolutionary War, realizes she was wrong. Magic is real. And it's not really her friend right now.